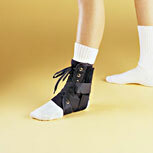 Low profile ankle bracke for swelling and chronic ankle sprains that fits in shoes and boots. The Hely Weber Webly Ankle Orthosis provides heavy gauge ballistic nylon, with non-stretch, non-fraying nylon straps. Straps sewn to eliminate Achilles irritation.